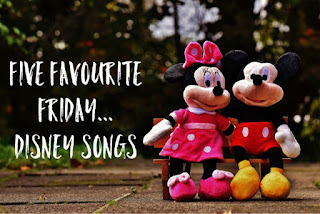 It's Friday again and for this week's Five Favourite Friday post we're looking at 'Disney Songs' (Nikki's choice). It's a bit of a short post this week, as I've not got much to add about the songs each other than these are my favourites! As always, I'll limit myself to only one song per film, but I have included other favourites in the honourable mentions at the end. I'm also limiting myself to songs from classic, traditional films, I'm not going to select songs from other Disney franchises (Star Wars, Marvel, etc.). Other songs that deserve honourable mentions include 'You're Welcome' and 'Let It Go', both modern classics that I hope invoke the same emotions in the future that my five songs stir in me now. Also, from the older classics 'Heigh-ho', 'Beauty & The Beast', 'Circle Of Life', 'Under The Sea', 'Can You Feel The Love Tonight?'... seriously, there are some great Disney Songs out there that could easily have made my list. Which Disney songs would you have included in your list? Let me know in the comments below. As always, you can check out Nikki's favourites on her blog, Just Around The Riverbend. Next week we will reveal our favourite 'MCU (Marvel Cinematic Universe) Characters'.